Kids of all ages will love this recipe. If you’re looking for a way to cool off during the dog days of summer, this cookies and cream cups recipe, the week 19 recipe for the 52 Week New Recipe Challenge, will help. Inspired by a recipe from Ree Drummond, The Pioneer Woman, they are simple enough for kids to make. No sharp tools are involved. The original recipe calls for the reserved Oreo cookies to be crushed and sprinkled over the top but I thought half a cookie would be a fun way to go. Once they are frozen, place the pan in a rimmed sheet pan and pour a bit of almost hot water, very warm, around the pan to loosen the cups. Serve as many as you need and put the remainder in a freezer safe container and store in the freezer. They will keep a few days without getting freezer burn. This is a great treat to make in advance of a pool party or backyard BBQ. Crush 15 of the cookies into fine crumbs. Add the melted butter mixing to combine. Press some of the crumbs into a 12 cup muffin tin and set aside. Break up 6 more cookies and mix into the softened vanilla ice cream. 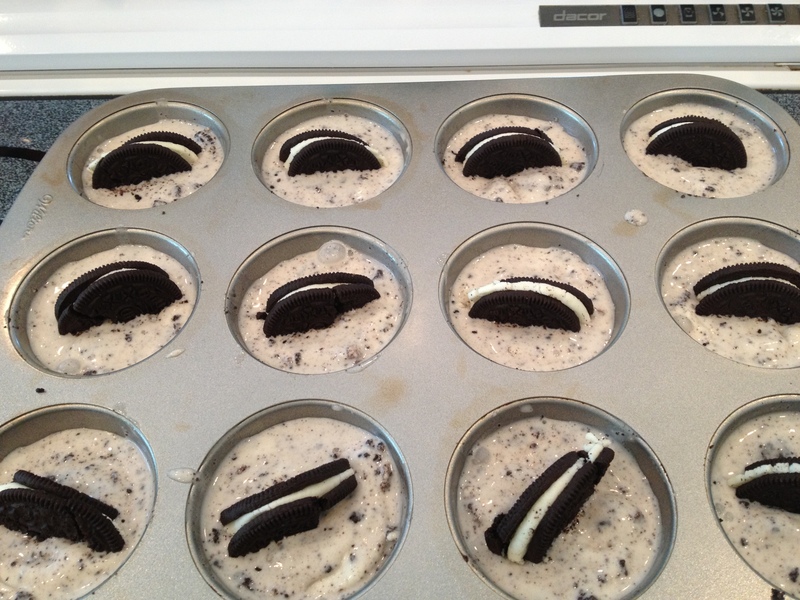 Soon some of the ice cream mixture into each muffin cup. Break remaining 6 cookies in half and put half in each muffin cup to garnish. Freeze until firm, then remove them from the pan. Place in airtight container and store in freezer. This entry was posted in 52 Week Challenge, Cookies, Desserts, Kid's Favorites and tagged backyard BBQ, cookies and cream, cookies and cream cups, dessert, dog days of summer, ice cream, Kid friendly, kids in the kitchen, muffin tin, Oreo's, pool party, vanilla ice cream. Bookmark the permalink. Cute idea! I pinned this too! Thanks, Nancy! Fun to make too!